Found primarily in Lake Sentani in Irian Jaya, Indonesia. Males are bright red to copper in colour, occasionally have silver upper parts. Females are silver to yellow-brown. A schooling fish that does best in groups of 5-6 or more, be sure to have more females than males. Do well with other similar sized peaceful fish including other Rainbowfish, Danios and Corydoras. Best not kept with shy fish as they may be bothered by this fish's active nature. Does best in a mature spacious tank which is well filtered and with some dense planting as well as open swimming space. They prefer a soft current and not too acidic. An active mid-swimming schooling fish. Males will display to one another. 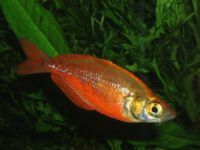 Typical high bodied humped Rainbowfish shape, the males are a vivid wine red with iridescence and a yellow-green belly. Females are far paler in colour, they are more yellow-silver. This fish is listed as vulnerable on the IUCN Red List and therefore if you see this fish available in aquatic stores you should enquire whether its farmed or wild caught. Wild caught fish should be avoided. When buying this fish be wary of hybrids, a result from some Asian breeders, they are known to hybridise with Glossolepis wanamensis and Glossolepis multisquamata. If they don't look quite right, then chances are they're undesirable hybrids and should be avoided.